Running out of money is one of the major reasons startups fail. “We started CloudOptimo because we have seen many companies spending lots of money on infrastructure - sometimes 10 to 15 percent of their revenue. CloudOptimo is an Intelligent Cloud Costs Optimization Platform, which reduces costs upto 80 percent while ensuring high availability and consistent performance. Our solution also helps many companies improve their architecture and adopt industry standard code deployment methodologies,” says Vaibhav Kamble, Founder and CEO. “The experience has been great so far. Various sessions on technical and business aspects were of great help as they bring the best instructors from Silicon Valley and other leading organisations. 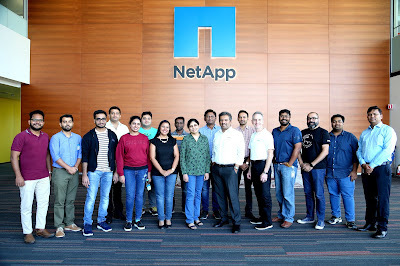 We are trying to leverage NetApp's connections for various go-to-market strategies for domestic and global markets. We are also working closely with NetApp to create a world-class product demo for our existing and prospective customers to explain our product in a simplified manner, as the cybersecurity domain is difficult to apprehend,” says Sandip. FirstHive was born as a central marketing brain that connected all marketing interaction channels (online and offline) of an organisation and all their tools - to deliver a single unified customer view with comprehensive interaction context. With this identity unlocked, the marketer can deliver consistent journeys focused on every unique consumer, across all channels from a single platform. “FirstHive’s approach is unique and fundamental to the marketing challenge - we believe this puts us in the league of global innovative products in MarTech. We work with some of the largest consumer brands across India and SouthEast Asia today and are aggressively looking to expand. We have delivered incremental business of over $2 billion to our customers over the last 24 months,” says Aditya Bhamidipaty, Founder & CEO of FirstHive. Aditya holds a PGBDM degree from IIM Ahmedabad and prior to starting up he was responsible for iGate’s sales in Europe. He has worked with P&G in India as well. Birendra Kumar Sahu is VP - Technology for the platform and brings over 18 years of combined experience across Big Data, ML & AI. He has over seven patents and 85 Invention Disclosure Reports to his credit. Vishal Sukheja leads the product management and marketing functions for FirstHive and brings over 12 years of cross-functional experience in the space. He believes the NetApp Excellerator experience will add value in two key areas -- technology mentorship and go-to-market based on mutual synergy.